To drain the excess water from the dacha or backyard it is necessary to create a drainage system. With its help, you can protect the area from waterlogging and buildings from destruction. One of the components of such a system are ditches. They may have different sizes (depth, width and length), but in any case, their walls must be strengthened. Otherwise, the water will turn the ditches into real ravines, which will reduce the effective area of ​​the site. How to strengthen the ditch in the country? This is what the article will be about. using structures and devices made in the factory. 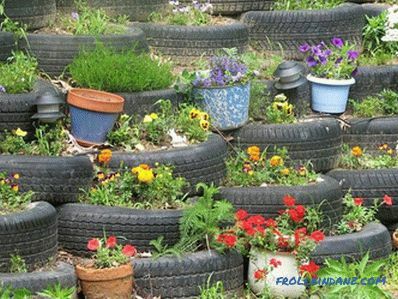 The walls of the ditch are strengthened with slate, automobile tires, stones, and also with the help of planting with the help of available materials. This method is suitable for small-sized ditches or at a low angle of slope. 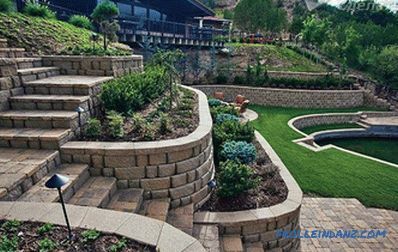 Different biomats, gabions, geogrids and geogrids are used at a slope angle of more than 8 -15 degrees. Also, such devices are used in the arrangement of large width ditches. 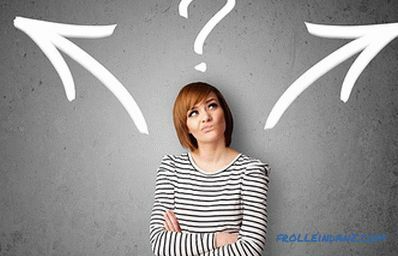 Each method of strengthening has its pros and cons. This will be discussed later. One of the easiest and most easily accessible methods strengthening the walls of the drainage ditch is the use of slate. You can also use the material that was in use. The main thing is that there are no large holes and cracks. Slate technology is fairly simple. Sheets (whole or cut, depending on the size of the ditch) are laid on the slopes of the ditch tightly to each other. This can be done both vertically and with a slight bias. Then from two sides of the sheets, in staggered order, pieces of reinforcement or thin pipes are driven in. ease of installation. All work can be done by one person. The disadvantages of this design in its fragility. The appearance of the plot itself may also suffer. Strengthening the slopes with the help of old automobile tires looks more aesthetic. In addition, this method allows you to make a structure that will last much longer than the slate version (up to several decades). Here you can resort to two methods, depending on the available space. One implies stacking tires at the edges of a ditch. Inside the ground is filled up, but better sand or gravel. For greater reliability, you can drive metal pipes. If the area allows, it is better to put the tires with offset. Each top row fits up to half the bottom. The result is a kind of ladder. Inside the ground poured and you can land the plants. Thus, it turns out a beautiful slope. 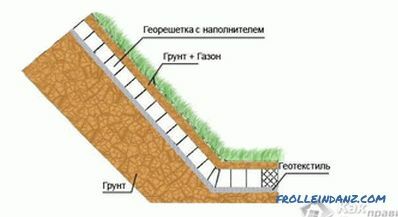 If the ditch is small and the angle of the slope is less than 8 degrees , then its walls can be strengthened with the help of plants. Along the edges of planted small bushes or perennial grasses. Their roots will firmly strengthen the walls and prevent the water from washing them out and turning the ditch into a large ravine. Geomats and biomats are made in the form of a polymer sponge. 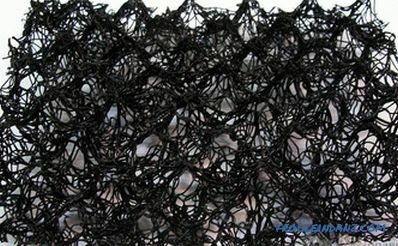 With the help of high temperature, several nets of polymers are soldered. 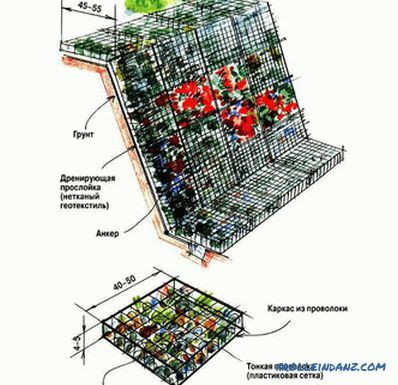 Such a structure is impermeable to water, but at the same time allows the germination of plants. The slope is being prepared. All rubbish is removed from its surface and leveling is performed. Then it is desirable to compact the surface. This is especially important if the area is sandy soil. Then the roll is rolled to the base of the ditch and the excess is cut off. The next row fits in the same way and overlaps with already laid. The tolerance can be up to 15 cm. Now the entire surface is covered with a small layer of soil and perennial grass seeds are added (if there is a need or desire). 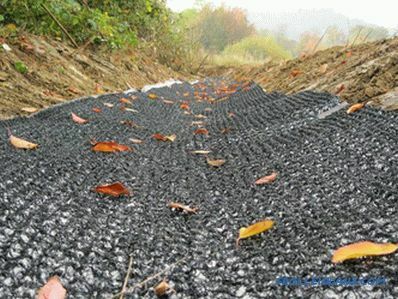 Another type of material for strengthening the slopes of the ditches is a geogrid. It is a network of polymeric material with a polyester base. 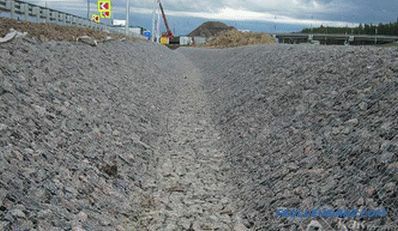 The geogrid is cut into desired pieces and is laid on a previously prepared slope (the surface must be cleaned, even and compacted using a hand roller). Grids are laid close to each other and sealed with anchor brackets. From the top, the grid can be covered with a layer of soil and planted. For these purposes, such herbs as mint, periwinkle and mshanka are well suited. These herbs with their roots will securely hold the coating in place. 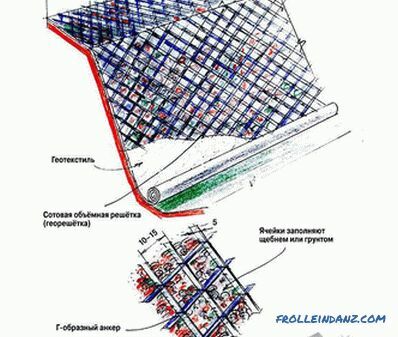 More powerful designs for strengthening not only slopes, but also the bottom of the ditch are geogrids. They are made of polypropylene and polyethylene. 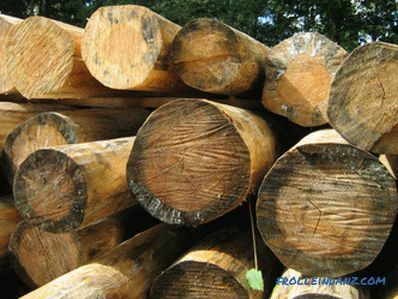 Such products are not afraid of corrosion, they are quite durable and able to serve for many decades. 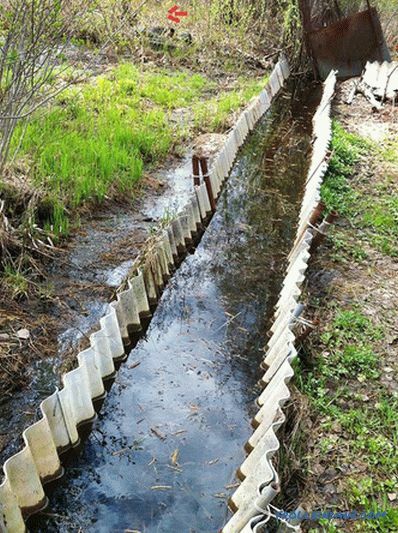 Before installing them, it is necessary that the drainage ditch is dry. You also need to prepare anchor fasteners, hammer, small gravel. After draining the ditch, all debris is removed from the surface (large branches , stones, etc.) and large vegetation. In this case, small grass can be left in place. Then the geogrid is spread. 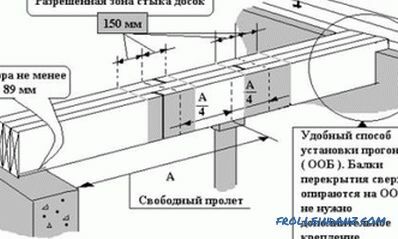 This must be done over the entire area of ​​the channel; it is advisable to cut off the extra pieces immediately. For a long service of the geogrid, it must be properly and securely fastened. This is done with anchor brackets or hooks. 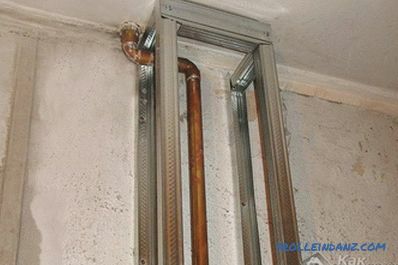 They can be purchased together with the grille or make their own hands from reinforcing rods with a diameter of 15 mm and a length of 50 to 110 cm. Fasteners are placed in a checkerboard pattern at a distance of at least 30 cm from each other. The next step is to backfill the geogrid. Sand can be placed at the bottom of the ditch (if it will rarely be filled with water) or rubble (if drains are constantly flowing in the ditch). On the slopes it is better to use the soil sown with grass. So the grill will be more securely held in place. A more expensive, but also more reliable, way to strengthen the slopes of a drainage ditch is to install gabions. In addition, such designs and will look more aesthetically pleasing and respectable. 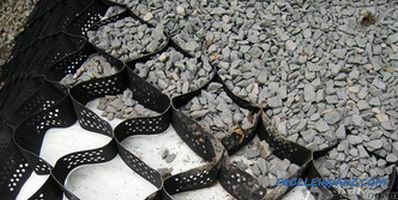 Gabion is a factory product made in the form of a parallelepiped (box). The material used is a metal wire double torsion. In such "boxes" put large stones or pebbles. 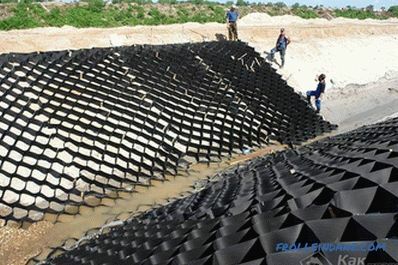 Non-simple wire is used in the production of gabions. It has a polymer coating. Such protection extends the life of the product to 70 years. At the same time, the product is not afraid of aggressive environmental exposure and can withstand heavy loads. Before installing the gabion, you need to prepare a slope. Since the product is of considerable size, excess soil is removed. Gabion is placed in its place and filled with large stones or rubble. 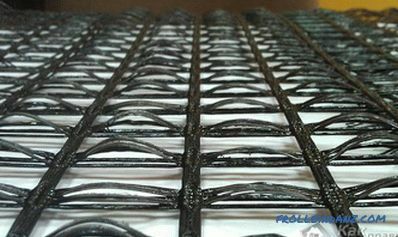 For greater reliability, you can fasten a netting net from above, it is desirable to choose it also with a coating of polymers. To improve the decorative view of the top of the grid, you can place stones or pebbles. If you have welding skills and the necessary equipment, you can try make gabion do it yourself. For this fit pieces of reinforcement. They are welded together, making the grid. For long life, all parts can be coated with an anti-corrosion compound. When strengthening the slopes of drainage ditches, do not forget about the foundation. Here you can use sand or crushed stone, depending on the frequency of filling with water. If the ditch is small and is in a conspicuous place, then the bottom, lined with natural stones, will look beautiful. Especially beautiful effect is obtained in combination with gabions. How to treat wood from mold and mildew?